Today was concrete day! By the looks of things, little else happened. Concrete was pumped in from the road about 20m away from the trench. It is a very smooth concrete, I believe additives are added to make it runnier. 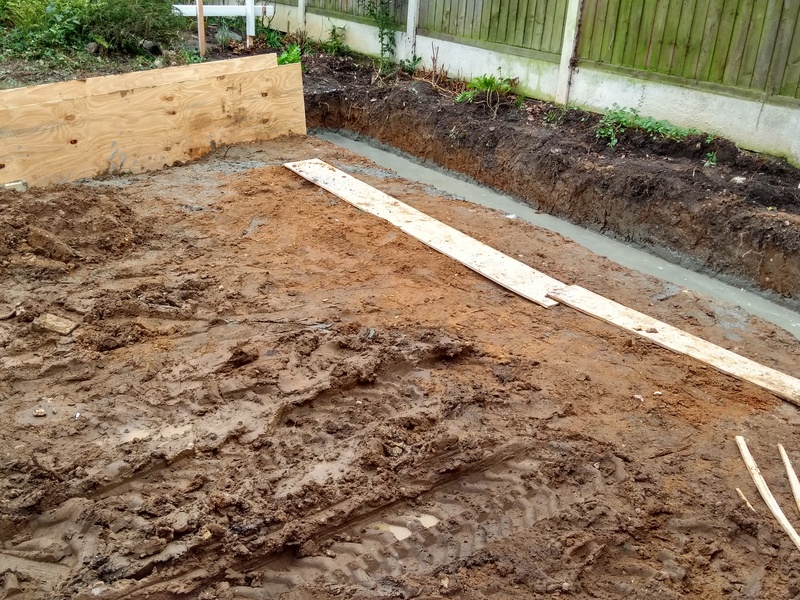 It will probably take a little longer than normal to harden, but they got the job done quicker and with far less mess than my previous builders managed on a much smaller extension – they used wheel barrows, and the concrete splashed all over the place! They part filled the section with the drainage, so they still have access to the old pipes, which will be replaced with new. Everything is covered to stop animals, children, bloggers and other random objects falling in. 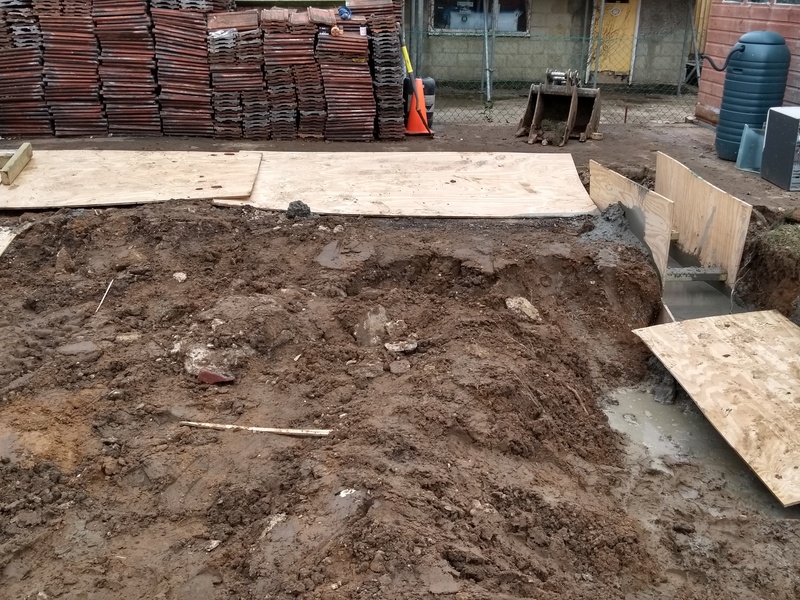 The ground level was also lowered a bit, so it looks like they will be ready for drainage and block work next week, and maybe the base concrete slab too. Before we look at the rest of the photos, let’s learn a little about foundations. Foundations, also known as footings, are the solid support below ground level that hold up all load bearing walls. In older properties with solid walls throughout, there would be foundations all through the house under every wall. Most modern homes and extensions only have foundations for the external walls that support the upper floors and roof. Internal walls are stud walls, and not load bearing, so no foundation is needed. Foundations are always concrete poured into trenches (also known as trenchfill) with blocks on top to raise to floor level. Blocks are used so that drainage and other utilities can be fed through the foundation block work, rather than be buried in concrete. Sometimes simple foundations are made, where a thin layer of concrete is placed at the bottom of the trench, and then blocks are used to create foundation walls. This is called strip foundations. Most extension builders avoid this as it is much easier to pour concrete into a trench than to lay bricks in a trench! Sometimes much deeper foundations are needed. If the ground is waterlogged due to high water table, or if the site used to be a waste dump, then pilings may be needed. These are sunk until rock is hit – they can go 10-20m deep and will cost you a small fortune! Concrete comes in different grades, which provide different strengths and curing times. Concrete takes around 28 days to (almost) fully cure after being poured – in large projects, the concrete can take years to be fully cured. 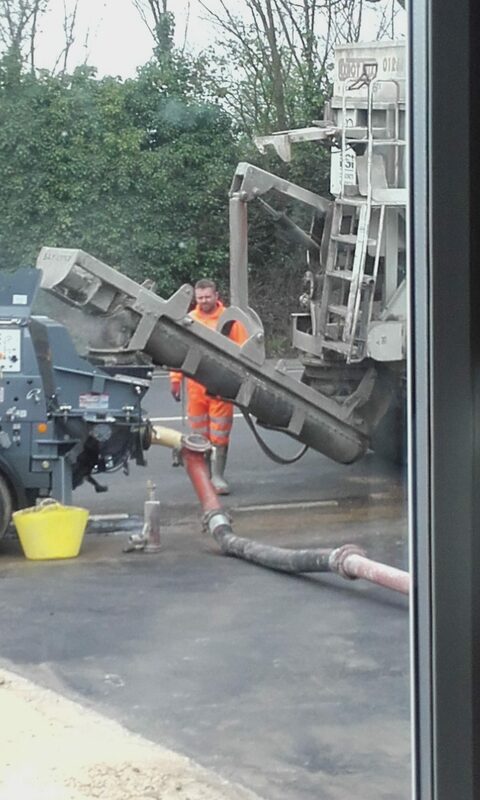 C25 is usually used when pouring foundations. What Work Is Carried Out To Make Foundations? First, a foundation trench is dug out, either by hand or digger. Foundations are usually around 60cm wide to support a 30cm wall. Minimum depth for building regulations is 1m, but usually they need to go deeper. Depth depends mostly on depth of existing foundations, type of soil, drainage, and proximity of trees. 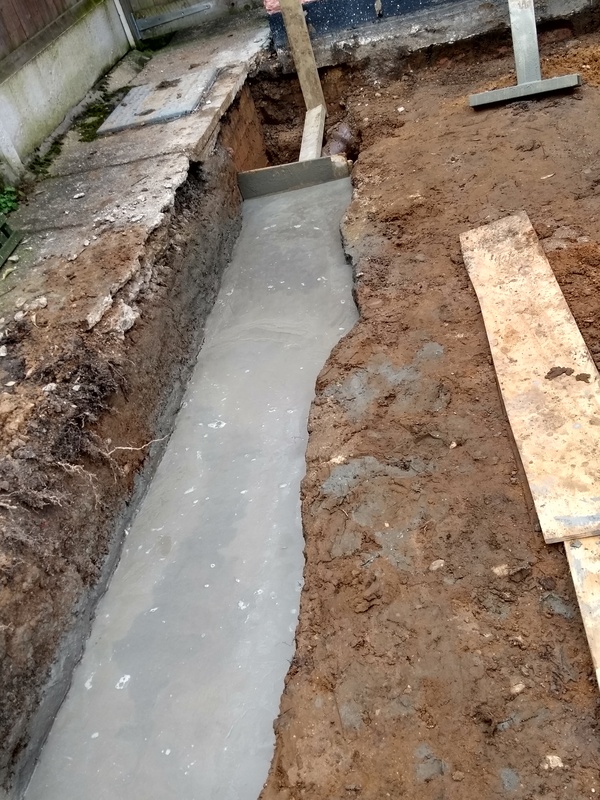 My foundations were going to be 1.2m, but due to decades of waterlogged soil caused by failed rainwater drains, they needed to be dug to 1.8m in some places. 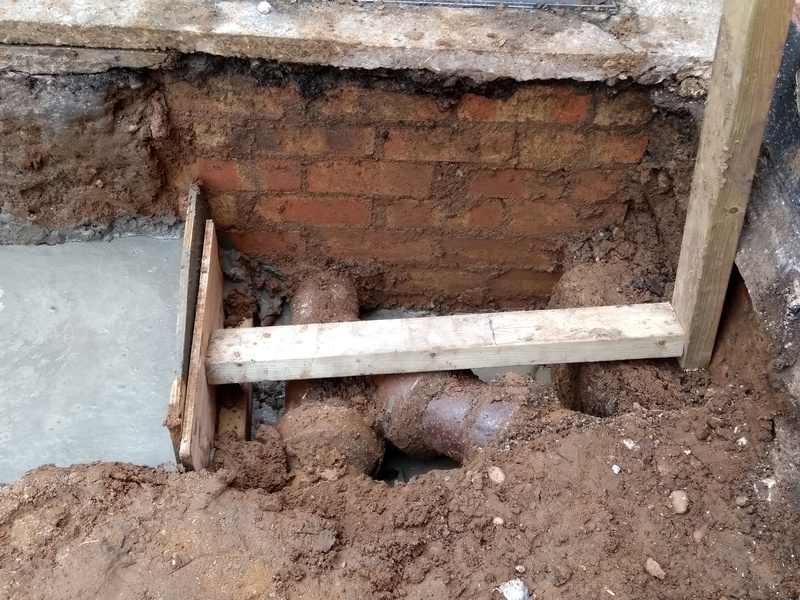 Building control will usually want the foundations to match the existing house if they are deep, and will ask to see the existing foundation depth. 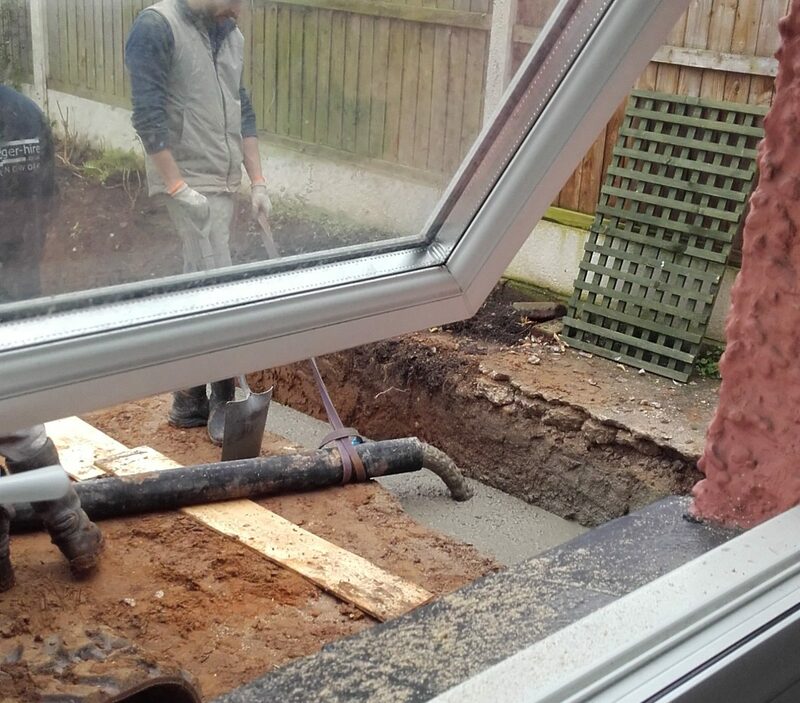 You must get your trenches inspected by building control before filling them with concrete. 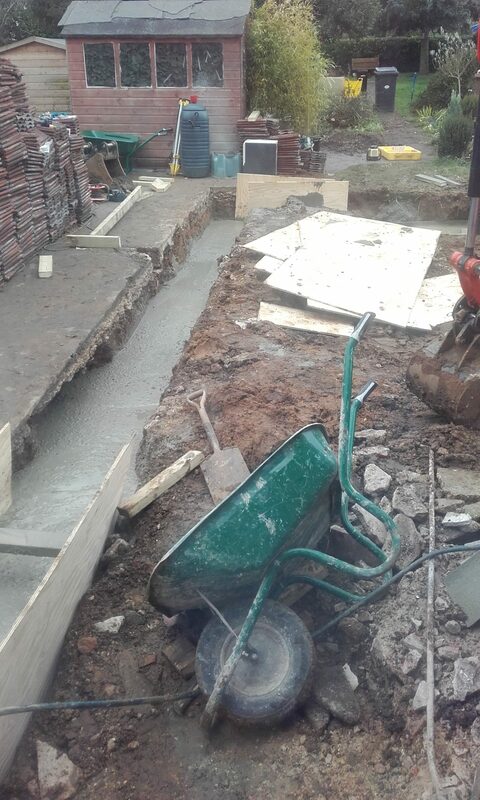 The concrete is delivered to the foundation trench either by wheelbarrow or by pump. Pumped foundations allow one builder to carry out the work by themselves, whereas wheelbarrows will take several workers. For very small projects, such as bases for sheds, it may be cheaper to mix the concrete yourself on site. But for foundation trenches it is not cost effective – the labour costs just to make the concrete is huge, and your labourers will be utterly exhausted at the end of the day. The biggest risk is that you may not get the trenches poured in one go. Always go for a ready mix! Published April 13th, 2018; edited April 25th, 2018.